The Southern Illinois University Edwardsville School of Pharmacy (SOP) presented 82 students comprising its class of 2020, with their professional white coats during the 11th White Coat Ceremony held Friday, Sept. 23 in the Morris University Center’s Meridian Ballroom. “The coats you wear today are a symbol, or outward manifestation, of professionalism,” said Gireesh Gupchup, PhD, dean of the SOP. “It’s what’s in the white coat that really matters. 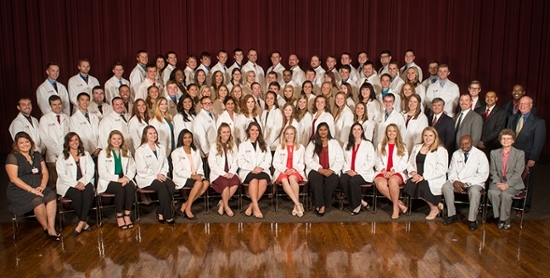 The white coats symbolically represent the class of 2020’s transition from students to student pharmacists. SIUE Chancellor Dr. Randy Pembrook congratulated the students on pursuing their calling to serve. The evening’s keynote speaker was John Glass, hospital administrator for Shriners Hospital for Children in St. Louis. The presenting sponsor was Shop ‘n Save Pharmacy. Photo: The SIUE School of Pharmacy Class of 2020.